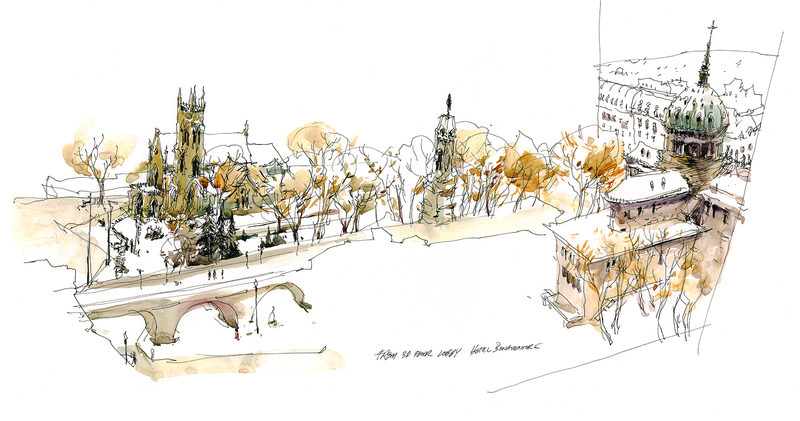 Your Secret Winter Drawing Spots: Send my publisher a Comment and Win a Copy of The Urban Sketcher! Hey everyone! I wanted to point to an article of mine about winter sketching: Drawing Inside, Looking Out. It’s up on my publisher’s blog as of this morning – AND – they’re running a contest! If you’re a US citizen – all you have to do is post a comment on their blog and you’ll be entered to win a package of art supplies. (I don’t know what – probably donated product samples) – as well as a copy of The Urban Sketcher. Which all of you have already I am sure, but will make an excellent gift to a friend, or donation to your local library. Like this view from the third story lobby at the Hotel Bonaventure, overlooking Place du Canda. (Link to Map). I found this spot by accident while attending a conference, and have been back to draw it a couple of times. They have another spot – a glassed in faux-Japanese garden – so you get two for one here. Plus the hotel bar if you are so inclined. If we all post with our city and our favorite ‘secret winter drawing spots’ everyone benefits :) They can even be used in warmer weather on a rainy day. At the end of the month I’ll summarize the list here for everyone to use. Feel free to include a link to your own sketch if you like. You’ll be helping out everyone as we hunt for good places to sketch this winter. 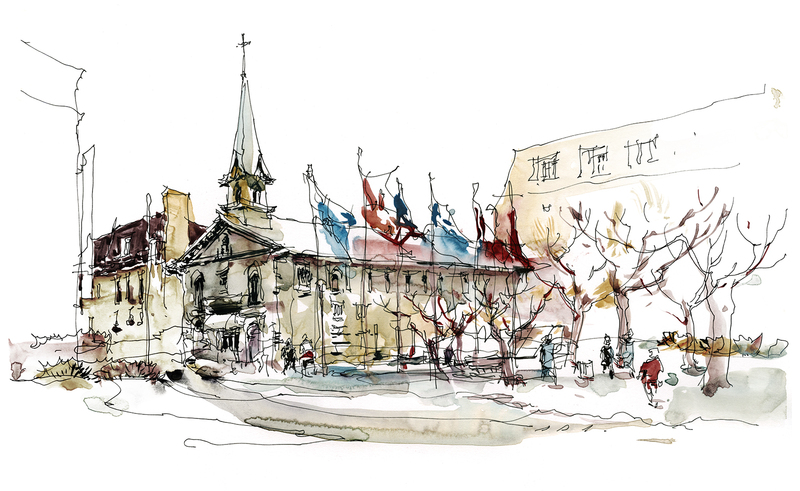 ← Urban Sketchers Montreal is Going Sketching for Chinese New Year: Jan 22! 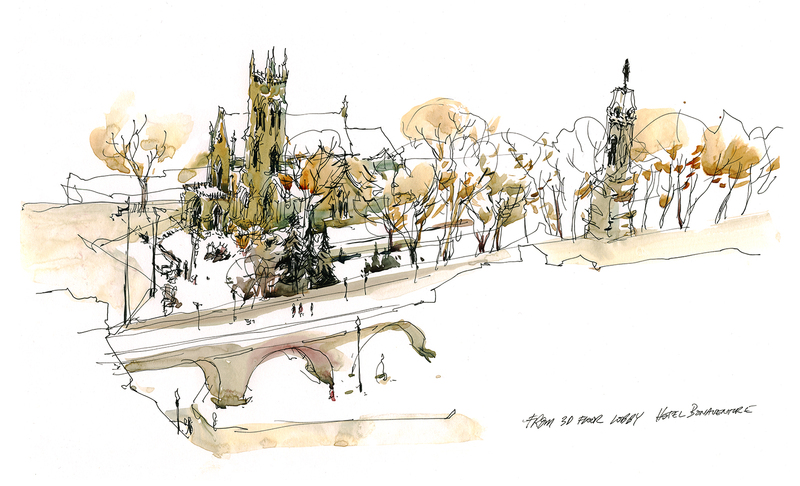 Wonderful sketches of my old home town… thank you Mark for the great sketches of Montreal. Love your sketches! Sounds like a great place, must try to visit someday! So jealous. Wish I had architecture in my town like this – and so plentiful too. Question: Are you drawing the major branches and doing a quick simple wash or dabs on the trees because they are, at the time of year, bare? Or just because you’re working fast? Why is this draw only available to a person in the United States? My book publisher is American and has those rules :) I think it’s blanket rule for the cost of postage is all. Your sketches never fail to inspire me! These faster, sketchier ones are real studies in using minimal detail but achieving recognizable places. I really do love this style of art. Check my stuff out if you have the chance to.